The Dragon Boat, or Duanwu, Festival is a long-standing tradition in China, Taiwan, and wherever Chinese culture has spread it. It occurs on the fifth day of the fifth month of the lunar calendar. This year (2010), it falls on Wednesday, June 16th. 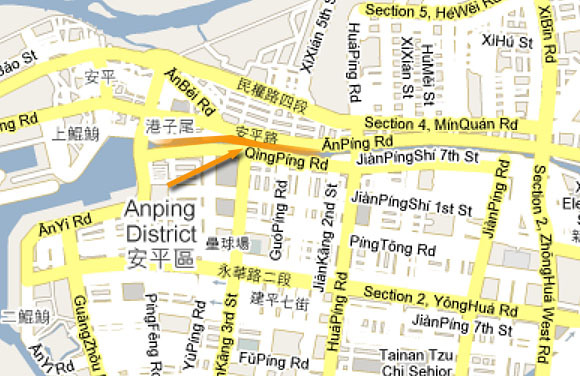 In Tainan, the boat races are being held on the Tainan Canal in Anping between Anyi Bridge and Chengtian Bridge starting at 6PM. A total of 141 teams will compete using 12 dragon boats. The Dragon Boat Festival is a centuries’ old tradition in Chinese culture. The festival is often linked to the commemoration of an ancient scholar named Qu Yuan who drowned himself in a river after being exiled for conspiracy. For many Taiwanese it is best known as the June holiday from work, but for traditionalists, it’s a time to eat zongzi and watch dragon boat racing. The festival generally centers on the racing of dragon boats. These boats are traditional Asian longboats, similar to a long canoe. 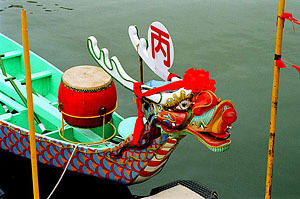 The boats used in festival races are ceremoniously adorned with dragon heads and tails. The teams range from 10 people for smaller boats to up to 50 people for very large boats. The standard team is comprised of 22 people including 20 paddlers, a drummer, and a helmsman. Races begin a few days before the holiday, but most people come out for the big races on the final day. That’s when, in addition to the races, there are a lot of food stands and cultural performances set up along the boardwalk on the north side of the canal. Even if you’re not interested in the races, there’s plenty of culture to absorb being among the crowd. Crowds of people fight for a view of the races. Date and Time: The fifth day of the fifth month on the lunar calendar (June 16, 2010); races start at 6PM, but the food stalls and cultural performances start a few hours earlier. sigh wish i could b in taiwan for the festival. me want holiday!